What maroon interior pieces do you need besides seats? car-part.com might be able to find a t-case for you. 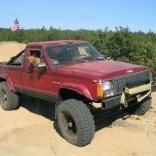 a 21 spline 242 will only be found in 87- (I think)90 XJs with the 4.0/auto. after that they went to 23 spline. Thanks Swampy! I just found a NP242 21 spline locally that I'm buying, otherwise I'd take you up on that offer. Really I'm looking for the cloth interior door panels and seats in Cordovan/Maroon.